For the last couple of weeks, it's been hard to continually turn down people when they ask us if we need any zucchini. But being in the middle of our move, we weren't cooking every day. Now that our kitchen is all set up and raring to go, we decided to indulge when we were asked recently. Now what to do with zucchini? Luckily, Melissa found this awesome recipe from Cooking Light for Zucchini Casserole that also required us to make a Red Pepper Aioli (separate recipe). I made the aioli -- I had never made one before and didn't know what they were, even after hearing it on "Top Chef" with regularity. It's a type of garlic mayonnaise, Epicurious says. 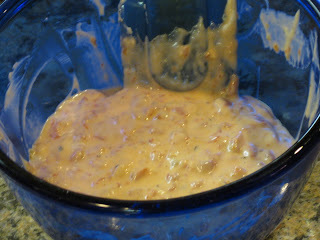 So in the one for this dish, combine garlic, mayo, salt, crushed red pepper and diced roasted red bell pepper. We chose to dice the roasted pepper instead of putting the ingredients into a food processor because, well, it was less clean-up work. First, preheat the oven to 375 degrees. 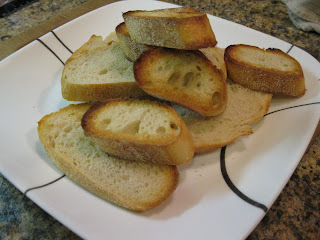 Then gently fry up the bread slices in some oil in a pan. 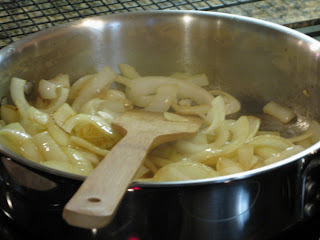 Then saute some onions in oil in a skillet for a few minutes until they carmelize. Drain the tomatoes, reserving some liquid for later. Add basil, thyme, pepper and garlic to the tomatoes. Now, onto the assembly. 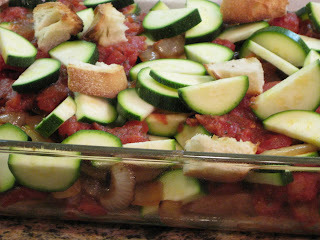 In the baking dish, place some onions, some bread slices, half of the remaining onions, half of the tomatoes and half of the zucchini. Then repeat the layers. 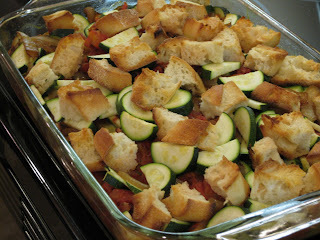 On top, sprinkle bread cubes around. Cover and bake for 30 minutes. Then uncover and bake for 25 minutes. Serve with some of the aioli. We put ours on top. We also opted to not use any mozzarella. The dish was still awesome. 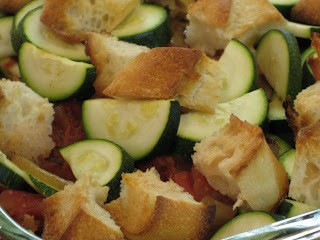 The zucchinis were succulent yet had a hint of a crispness. 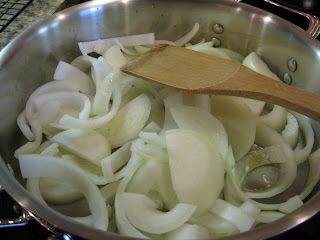 The tomato flavor was wonderful and the carmelized onions were a visual pleasantry on the plate. The aioli had a great smoky, roasted flavor and brought a nice chill in each forkful to combat the piping hot dish. This is definitely going into the short list of our favorite recipes.